The overall design concept of the campus concept is based on the simplicity of form in the existing historical layout and architecture of the campus. The proposed campus re-establishes the center of campus at the Center Circle, balancing the existing radial finger classrooms layout at the east with the more formal, clustered layout at the west. The addition of a student center plaza at the north, a student quad at the west, and small activities courtyards at the east promote individual, focused activity nodes beyond the Center Circle. The existing walkway element throughout the campus inspires the emphasis of outdoor walkway connections within the new classroom buildings. The existing school structures were designed in simple modern styles where new buildings adopted these features but added playfulness and sculptural forms, thus creating a basis of design language for future expansions. New buildings are sensitive and compatible to the scale, form and proportion to existing one-story buildings. Character-defining features, such as simple rectangular massing, shed roofs and brick façade accents, are adopted onto the new buildings. A consistent material palette will unify the existing and new building facades and tie the campus together. The new buildings are composed of steel framed/metal stud structure covered in 30/30 finished plaster. Extending the use of brick as an accent from the existing campus facades adds warmth to white plaster walls. New paint finish at existing walkway canopies renews the campus.By integrating and blending the new facility with the existing campus, the new buildings will integrate seamlessly into the architecture and operations of the existing Sherman Oaks Center for Enriched Studies campus. Overall, the new buildings take the simple modern building layout and forms of the existing classroom buildings to create a campus blend. The materials were chosen carefully for durability and ease of maintenance. The circulation is logical and simple. The design takes advantage of the natural light available to create a bright and cheerful environment for the students both inside and outside. 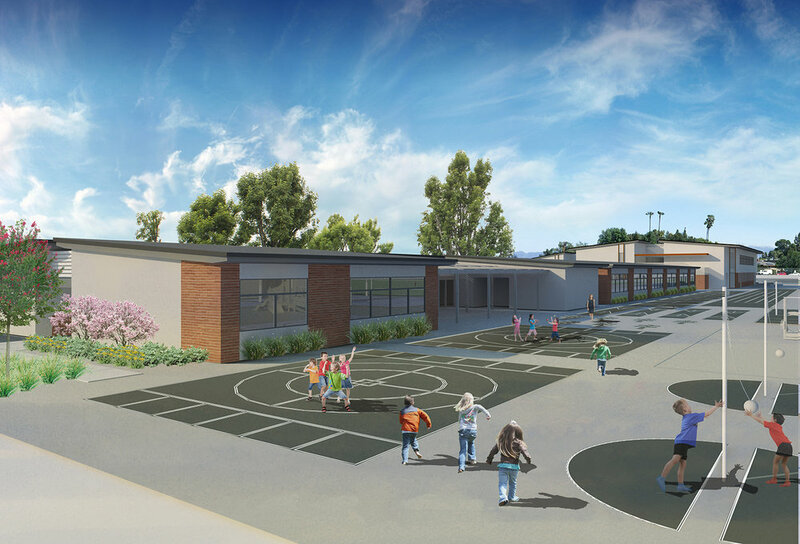 These campus additions will help further the successful mission of Sherman Oaks Center for Enriched Studies campus for 21st century learning environment.